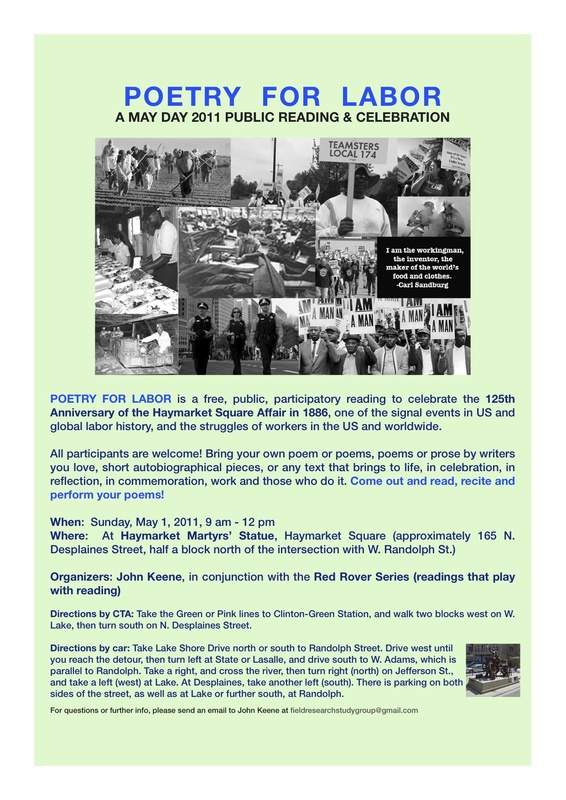 Sunday, May 1, 9 AM to 12 Noon at Haymarket Square, Randolph & DesPlaines; Poetry for Labor: A free, public participatory reading to celebrate the 125th anniversary of the Haymarket Square Affair, bring your own poetry or prose, or poetry or prose that you love, that brings to life in celebration, in reflection, in commemoration work and those who do it! 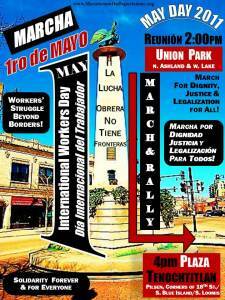 Sunday, May 1, noon rally sponsored by Jobs With Justice to protest Walmart international worker exploitation. 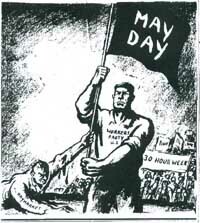 March from Walmart in Forest Park (DesPlaines and Roosevelt Road in Forest Park) to Haymarket Monument in Forest Home Cemetery (see next entry). 2:00PM Reunion at Union Park, Corners of Lake St and Ashland Ave.
May 5th, Thursday,6:00 – 7:30 pm Conversation about the difficult and surprisingly dangerous life of laundry workers in Chicago at Workers United 333 S. Ashland Ave. Have a conversation with Daisy Sewell who has both worked in a commercial laundry and worked to unionize laundry workers. Light refreshments, soda and wine will be served. Friday, May 6 7 PM JAZZ for Gaza with saxophonist Gilad Atzmon at Columbia College Chicago Ferguson Lecture Hall, 600 S. Michigan Ave, 1st Floor. Chicago, Il. JAZZA Festival is a mobile music and arts venture, hosting international activist educational music in conjunction with various humanitarian bodies aimed at raising funds and awareness for the people of Palestine. Three public events will celebrate the 50th Anniversary of the Freedom Rides and honor the amazing riders through original commissioned performance pieces by Neighborhood Writing Alliance, Congo Square Theatre, and Young Chicago Authors. These new works are inspired by the documentary film “Freedom Riders” by Stanley Nelson. Based on the award-winning book Freedom Riders: 1961 and the Struggle for Racial Justice, the film focuses on the campaign that went on to inspire a movement. 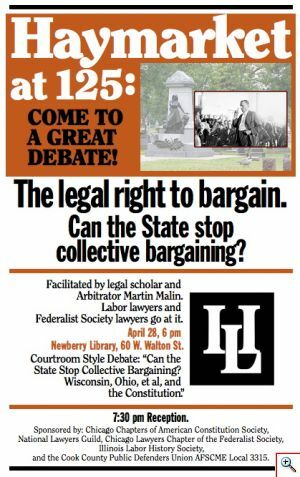 Friday, May 13, 6 PM, Dinner at 7 PM In Praise of Public Service : 53rd Annual Eugene V. Debs – Norman Thomas – Michael Harrington Dinner. As always, we are at a union hotel. The Dinner will be held at the Crowne Plaza Chicago Metro hotel at Madison and Halsted in Chicago, beginning with a cash bar at 6 PM. The Dinner is at 7 PM. Honorees: John Cameron, the Director of Political and Community Relations for AFSCME Council 31, and Jeremy Schroeder, the Executive Director of the Illinois Coalition to Abolish the Death Penalty. May 30, 10 PM Mike Felten plays an on-line Memorial Day show at this URL, so you don’t even have to leave your couch to hear Mike, who is a real spiritual descendant of Woody Guthrie!